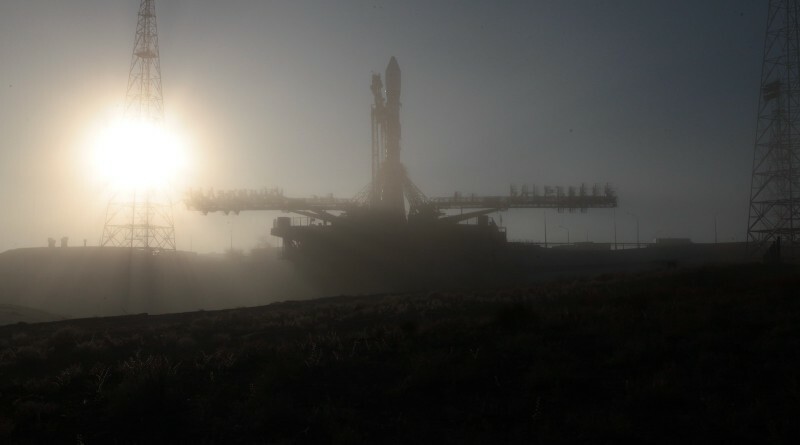 A Soyuz 2-1B rocket was rolled to its launch pad at the Baikonur Cosmodrome in thick fog on Thursday to head into two days of final preparations of a late night liftoff on Saturday, set for 18:56 UTC, 0:56 local time. Sitting atop the 48-meter tall Soyuz rocket is the third Resurs-P Earth Observation satellite, looking forward to a nine-and-a-half-minute ride into orbit. 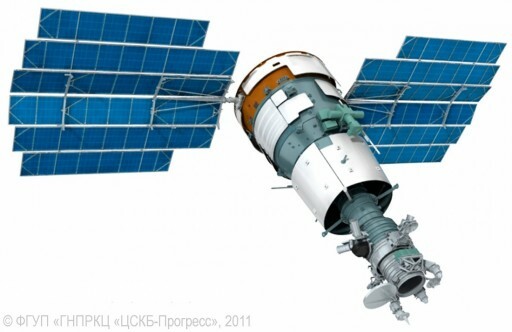 The Resurs series of Earth Observation Satellites is part of Russia’s civilian Earth observation and remote sensing program, operated separately from the country’s military reconnaissance satellites, although sharing common technology. As such, the Resurs-P satellites and their predecessors are based on their military counterparts and deliver a similar image resolution. Dating back to 1979, the Resurs program started out with a series of film-return satellites using the Zenit film-return satellites as a basis. The first electro-optical Resurs craft capable of downlinking imagery to Earth flew in 1983 and, over the 1990s, the transition from film-return vehicles to digital imaging satellites was completed. Resurs-P as a program was initiated to develop a successor to the Resurs-DK satellite that served as a gap-filler between the satellites launched in the 90s to a follow-on program. Expanding on previous capabilities, the Resurs satellites carry more instruments to be able to deliver high-resolution panchromatic imagery, multispectral imagery as well as hyperspectral data at varying resolutions and ground swath widths to serve a multitude of applications. The Resurs satellites employ the Yantar satellite bus – a robust satellite platform that started out supporting film-return payloads in 1974 and has since gone through several generations to keep up with current technology. Yantar started out as a purely military satellite platform before being modified to host electro-optical payloads and being inaugurated in the civilian satellite programs. Currently, Yantar is used for the Persona military reconnaissance satellites and the Resurs-P satellites that are very similar in design. The first Resurs-P satellite was launched in June 2013 for a lengthy checkout phase to put the new instruments to the test and identify any issues before the second satellite was launched. Resurs-P No.2 was built alongside Resurs-P No.1 as the second prototype satellite and headed into orbit in December 2014. After detailed testing and demonstration work, the Resurs Program was declared operational in mid-2015. Given their prototype role, the Resurs-P 1 & 2 satellites have an expected service life of five years while satellites 3, 4 and 5 are expected to operate for at least seven years. The Resurs-P No.3 satellite carries a high-resolution optical imaging payload that achieves a ground resolution of one meter in the panchromatic band and 3.4 meters for multispectral images. The satellite also carries a Hyperspectral Imaging Payload covering over 200 spectral channels, a Wide-Field Multispectral Imager that images a wide ground swath, and a transponder for the Automatic Identification System tracking ships at sea. Resurs-P No.3 was initially expected to launch in late 2015, but the launch was pushed to March 2016 and the satellite arrived at the launch site in late December to enter its final preparations for launch. 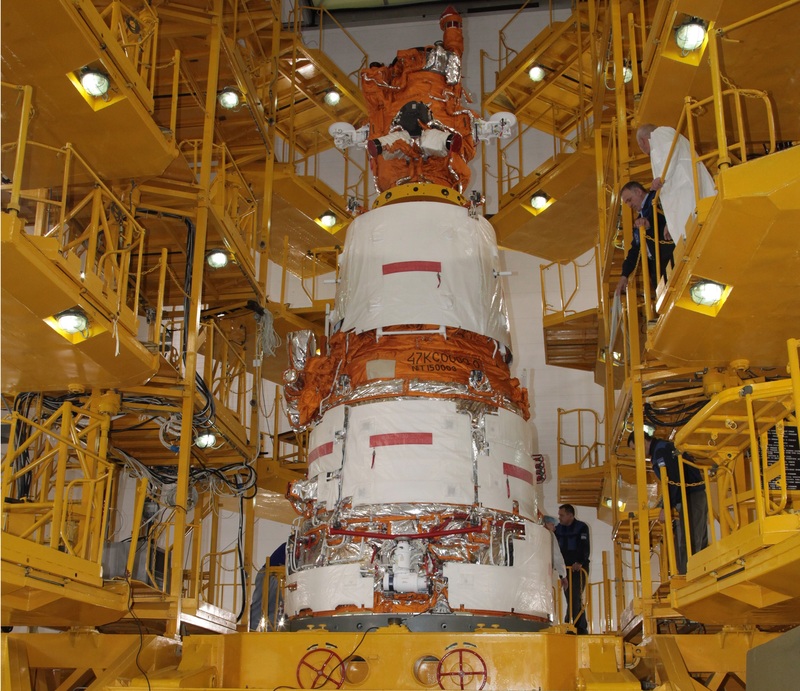 At the Baikonur Processing Facility, the satellite underwent detailed stand-alone testing and inspections before heading into thermal vacuum testing. In early March, the satellite was loaded with around 900 Kilograms propellants and had its two power-generating solar arrays installed. 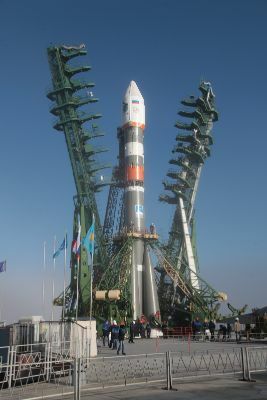 Next was the encapsulation of the satellite in the Soyuz payload fairing – this launch uses the same fairing type as the first Resurs-P mission while the No.2 satellite used the larger ST-type fairing. 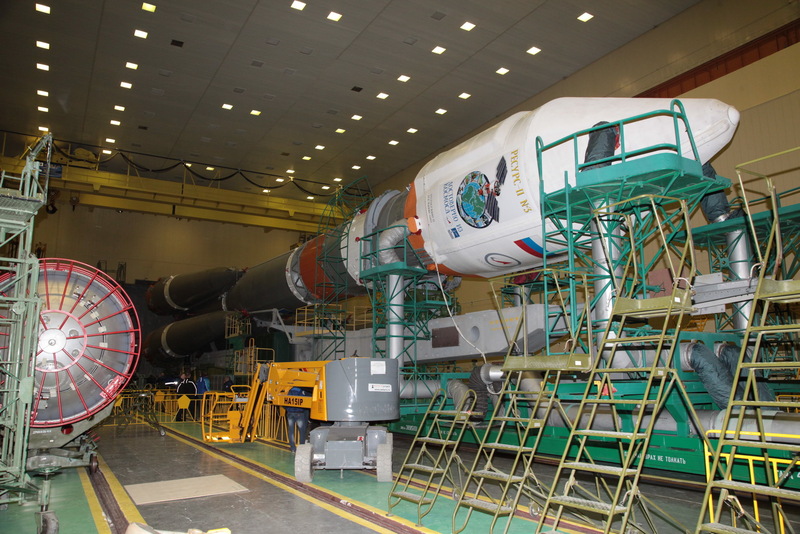 On Wednesday, the Soyuz 2-1B was assembled for launch, meeting the Resurs-P satellite for the first time. The large Core Stage has been mated with the four liquid-fueled boosters in the weeks ahead, leaving only the satellite to be attached to the modified Block I third stage which was then installed on the core stage. After initial testing of the launcher, the Russian State Commission convened in the evening hours on Wednesday to perform a review of the status of launch preparations, giving the green light for the rollout. 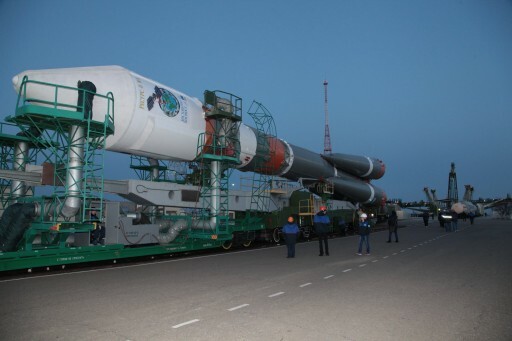 On Thursday, Soyuz emerged from its processing facility at the usual early morning hour in a tradition dating back to Yuri Gagarin’s historic flight 55 years ago. 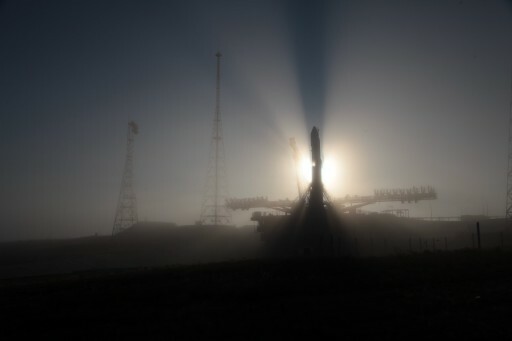 Resembling the rollout of Resurs-P No.2 over a year ago, Soyuz made its way through thick fog before arriving at Site 31/6. Reaching the pad, the Soyuz was placed in its vertical launch position and the two halves of the Service Structure were raised to provide protection and access platforms for workers to mark the start of the normal on-pad processing flow of the Soyuz that includes thorough testing and preparations for the countdown sequence that will begin on Saturday. Soyuz countdown operations start approximately eight hours before launch to put the Soyuz, and the Resurs satellite through a methodical process that includes the final steps to configure the vehicle for launch. Once activated, the Soyuz rocket completes a series of checkouts of its flight control system. Communication checks, electrical testing and propulsion system testing is also performed in the early stage of the countdown. At L-5 hours, the Russian State Commission convenes for the final pre-launch review of the countdown status to give the formal approval for Soyuz propellant loading. The Tanking Cars will have rolled to the pad by then, being connected to ground propellant systems to get ready to load the Soyuz with a total of 274,140 Kilograms of Kerosene and Liquid Oxygen. Soyuz fueling is expected to commence around L-4 hours as the four boosters, the Core Stage and the third stage are filled with Kerosene and supercold LOX. In addition, the boosters and core stage are loaded with liquid Nitrogen for tank pressurization; the third stage receives Helium pressurant. Propellant loading takes about 90 minutes and teams will conduct final close-outs of the launcher while fueling is underway. 60 minutes ahead of launch, the Guidance System is activated and the flight computers receive their flight software 15 minutes later. With final hands-on work complete, the two halves of the Soyuz Service Structure will be retracted as late as L-25 minutes followed by the evacuation of the launch complex. Ten minutes before launch, the inertial guidance system is configured for flight and the final Launch Readiness Poll is performed. Entering the Automated Countdown Sequence at T-6 minutes, the Soyuz launch vehicle will begin its final reconfigurations as part of a highly choreographed procedure. Inside the launch bunker near the pad, the launch key will be inserted to give clearance for liftoff. Over the final minutes of the countdown, the Soyuz completes the purge of its booster and core stage engines, begins pressurizing its 12 propellant tanks and transfers to internal power. One minute before liftoff, the onboard sequencer of the Soyuz assumes control over the final steps of the countdown leading up to the Launch Command at T-20 seconds, triggering the ignition of the engines. Soaring up to a cumulative thrust of 422,000 Kilogram-force, the RD-107A engines of the boosters and the 108A on the core will spin up their hydrogen-peroxide driven turbopumps to achieve liftoff conditions. 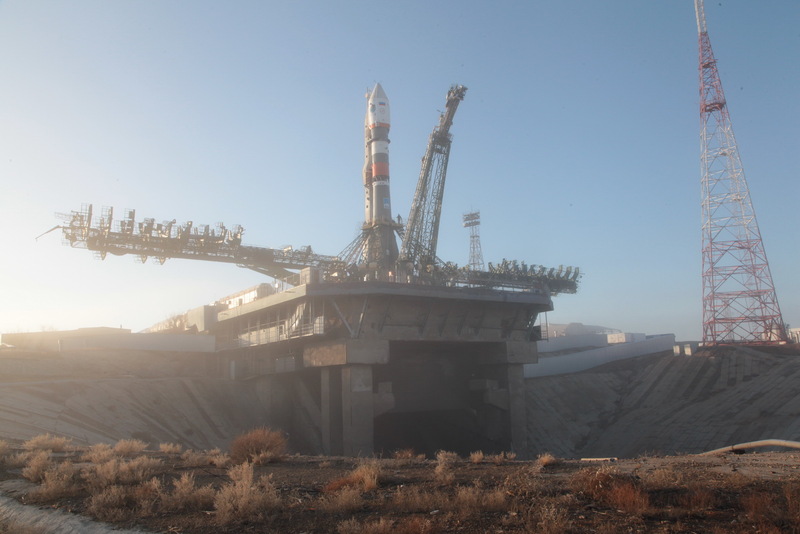 At precisely 18:56:00 UTC on Saturday, Soyuz will start rising from its launch pad, completing a vertical climb into the night skies above the Baikonur Cosmodrome. Soyuz will quickly execute a pitch and roll maneuver to start heading for a polar orbit inclined 97.3 degrees. Passing Maximum Dynamic Pressure and Mach 1 just after one minute into the flight, the Soyuz will continue powered ascent using its four boosters and the core stage – burning 1.6 metric tons of Kerosene and Liquid Oxygen each second of powered flight. The four boosters and their RD-107A engines will burn for 1 minute and 58 seconds, each consuming a total of 39,600kg of propellants to provide extra thrust to boost the vehicle to an altitude over 50 Kilometers. Upon shutdown of the engines, the boosters are separated by pyrotechnics and pistons that will send them into a tumble back to Earth. 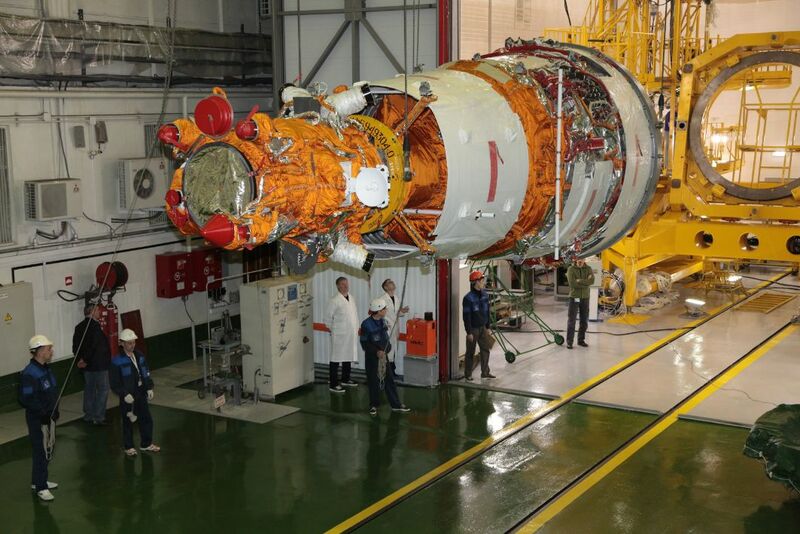 After booster separation, the Soyuz will continue powered ascent on the Core Stage alone, delivering 102,000 Kilogram-force of vacuum thrust until shutting down at T+4 minutes and 45 seconds. Moments after Core Stage cutoff, the RD-0124 engine of the third stage is ignited as part of the hot-staging sequence of the Soyuz. At T+4:47, the pyrotechnic bolts connecting the Core Stage to the third stage are fired to separate the stages and allow the third stage to continue powered ascent. A few seconds after staging, the aft section of the third stage is jettisoned to fully expose the engine compartment. Jettisoning its payload fairing once outside the dense atmosphere, Soyuz will expose the Resurs-P satellite as aerodynamic forces can no longer cause harm to the spacecraft. Providing 30,000 Kilogram-force of thrust, the third stage will consume 25,400 Kilograms of propellants over a burn of a little over four and a half minutes. Shutting down just after nine minutes and 20 seconds into the flight, the third stage will immediately release the Resurs-P satellite. The launch is targeting an orbit of 200 by 475 Kilometers at an inclination of 97.3 degrees. 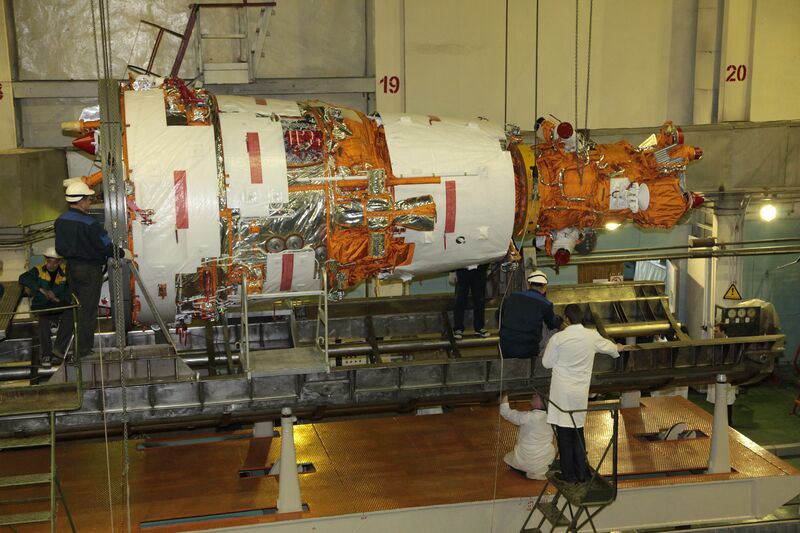 For a mission into LEO, Soyuz does not require a Fregat Upper Stage. After separation, the third stage of the Soyuz opens an oxygen valve that moves the stage away from the separated payload. Deploying its solar arrays and establishing a stable three-axis Earth-pointing orientation, the Resurs satellite will begin communications with ground stations to begin initial in-orbit testing. In the first several days of its mission, the satellite will use its main propulsion system for a circularization maneuver to reach its operational orbit of 477.5 Kilometers at an inclination of 97.28 degrees. Two maneuvers will be needed to achieve that orbit, typically performed on Orbits 37 and 69.